With the legacy of Tom Yawkey's racial intolerance – the Sox were the last team to field a black player – current owner John Henry says he's ready for the change. 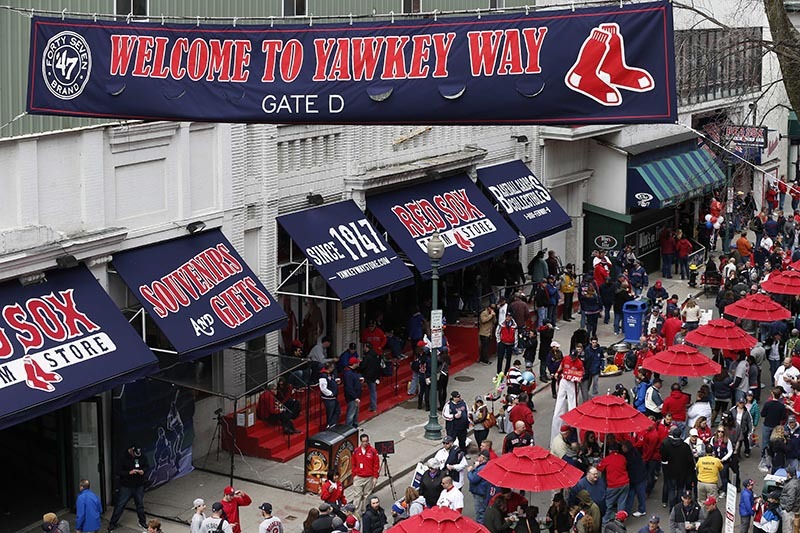 BOSTON — The Boston Red Sox will ask the city to rename Yawkey Way, the street alongside Fenway Park, to erase what owner John Henry called a haunting reminder of the team’s history of racial intolerance. Henry told the Boston Herald on Thursday that he welcomes changing the name of the street that honors his predecessor, Tom Yawkey, an inductee in the baseball Hall of Fame, and is the mailing address for the ballpark and team offices. Under Yawkey, who owned the club for four decades, the Red Sox were the last team in the major leagues to cross the color barrier while choosing not to sign black players, including Jackie Robinson and Willie Mays. “It’s a continuation of John’s strong feelings about tolerance and inclusion, and making sure that everyone in Boston and New England feels welcome at Fenway Park,” said the Red Sox president, Sam Kennedy. Henry didn’t immediately respond to a message seeking comment. Yawkey came into his inheritance in 1933 at age 30 and promptly bought into the all-white sport of major league baseball. Then he did what he could to keep it that way. As other teams abandoned the color barrier, the Red Sox held out, giving Robinson a tryout and scouting Mays but opting to sign neither. The club eventually signed Pumpsie Green as its first black player in 1959 – more than a decade after Robinson debuted for the Brooklyn Dodgers and after even Willie O’Ree took the ice for the Boston Bruins as the first black player in the NHL. Yawkey owned the club until his death in 1976, when his wife, Jean, took control. She died and left the ballclub in the care of a foundation that bore their name; a trustee, John Harrington, ran the team until it was sold to Henry and his partners in 2002. “When we got here in 2002, one of the first things (Henry) did was acknowledge the shameful past in terms of race relations and inclusion,” Kennedy said. Still, the team has struggled to accomplish its goal of making Fenway more welcoming to minorities. In May, Orioles outfielder Adam Jones said a fan called him a racist slur; Kennedy apologized. The same week a fan was banned from the ballpark for life for using a variant of the N-word while speaking to another fan about the national anthem singer. The Red Sox also distanced themselves from their flagship radio broadcaster, WEEI, where hosts doubted Jones’ version of the events; former Red Sox pitcher Curt Schilling also said Jones was lying. The Yawkey Foundation, which was funded largely by the $700 million Henry’s group paid for the team, has been a philanthropic force in Boston for the past 15 years. “The Yawkey Foundation has done a lot of great things over the years that have nothing to do with our history,” Henry told the paper. Among the things in Boston named for Yawkey are an athletic building at Boston College and the Red Sox Most Valuable Player Award bestowed by the local chapter of the Baseball Writers Association of America. Henry told the paper he would like to see the street renamed for David Ortiz; the city already has named an extension of the road after the former Red Sox slugger, who retired last year. “That’s a conversation for another day,” Kennedy said.